Welcome to London East Aikikai. We are members of the British Birankai and are directly affiliated with the Hombu Dojo, Tokyo, Japan. We are members of the JAC (the Joint Aikikai Council) and all students are insured through the JAC scheme. In 1983 Steve met Nobuyoshi Tamura Shihan 8th Dan who had recently established the National National Aikido Federation and in 1987 Steve Beecham the technical director. In 1987 Steve was awarded Yondan (4th Dan) under Shihan Tamura. 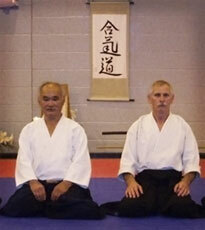 In 1989 TK Chiba Shihan invited Steve to teach at the Aikido London Headquarters, Shinmei-kan Dojo. (Shinmei-kan). In that same year Chiba Sensei confirmed his Yondan Grading with Hombu Dojo. Steve taught at the Shinmei-kan Dojo for 17 years. until his sabbatical in 2007. 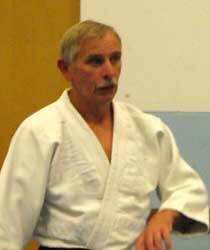 In January 2003 he was awarded Godan (5th Dan) by TK Chiba Shihan and has been a Shidoin with the British Aikikai/Birankai since its inception and also a member of the Teaching Committee. In August 2011 he was awarded Rokudan (6th Dan) by TK Chiba Shihan. Apart from teaching in the UK he has also taught in the U.S.A, Canada, China, New Zealand, France and Spain.